The Selection is out in the world, and thanks to you all, it’s doing very well. I get notes every day from people saying it’s one of their faves now, and there are some great tumblr pages dedicated to it, and I’m super happy. The Elite is all but done! The next step is the first pass pages, which means I get to see the book the way it will be printed. And I’m pretty sure I get to show you the cover art next month! Eeeee! I’m working on the novella right now, and I can’t tell you how much fun I’m having. I’m so stoked to share it with you next March! And, of course, there’s Book 3, still in its awkward teenage years, all gangly and tucking its hair behind its ears all the time. Once the novella is done, I’m going to help her adjust to life, and in two years, she’ll win prom queen. Wait and see. ...So, yeah, a lot’s going on. But have you noticed a theme? All I’m doing is writing. I used to create in lots of ways. I sang and was on a dance team. I baked, made tons of videos, and ripped up books to make art. Unless you count the tiny human, I haven’t made any non-writing stuff in a while. People ask about conquering writer’s block a lot, and while I’m not having any at the moment, one of the things I do is make stuff related to the story. Designing clothes, making family trees, drawing blueprints. This stuff excites me about my writing and makes me want to dive back in. But I also think non-writing creativity benefits your story telling. 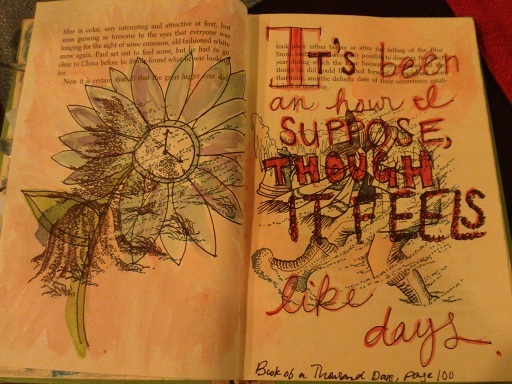 Last night I decided I was going to make something, and what ended up happening was an art journal. I figured I’d share my book and its theme, just in case it inspired you. For my book, I decided to use an actual book. This one came from a thrift store. I bought it for its illustrations. Then, I gutted it. I tore out a few pages every so often to give room for the bulkiness I knew I’d be adding eventually. Then, I grabbed what was sitting around and used that to make some art. For my journal, I’m going with a booky theme. Of course. I decided I would pick up a book, turn to a random page, pick a sentence, and just make something surrounding it. My first page comes from Wintergirls by Laurie Halse Anderson. It’s nothing spectacular. Just because I like to make art doesn’t mean I’m particularly good at it. That’s not really the point. Anyway, I had so much fun, I made another one. This one comes from Shannon Hale’s Book of a Thousand Days. So this is the start. I’m hoping to make at least one of these every week, just to give me another outlet. If you’re like me and working away, I encourage you to step away from the keyboard. It’ll make coming back so much fun.